I created this project as part of a Halloween Book. 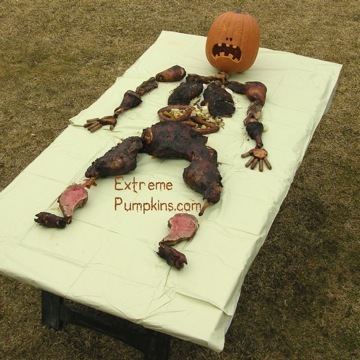 The book was published in 2009 and is called Extreme Halloween. You can buy it at Amazon! I’m surprised that I didn’t think of this sooner. I mean, I have liked cooking since high school and I have hated my fellow man since then as well. Why hadn’t I combined the two things before? If you also like to cook and hate people, you can serve this dish at a Halloween party. I guarantee you will be the talk of the town when the next newspaper arrives. Actually, this is a tasty and fairly easy to make Halloween feast. Perhaps it will begin to rival the traditional Turkey dinner as the most popular feast of the year. It is made from some of my favorite foods and will easily feed a crowd. 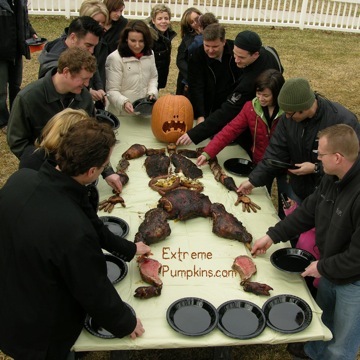 Depending on the size of your party you can make a huge carcass or a small one. I prepared the feast you see here and fed 10 people for dinner. It would also serve a party of about 14. If you have more people to feed, see the sidebar for things to add. Please don’t think I don’t know how to cook. I really do, but I made this process as simple as possible. I used instant potatoes, pre-made breadsticks and took any other shortcuts that I could. No one, I repeat no one will care. You are going to present them with a cooked human corpse. They will not be concerned with the grainy texture of its lungs. o	One plastic-lined, white paper table cloth. 1. The ribcage is first. Take each rack of ribs and trim it back so that it looks like human ribs. I did it by removing the smallest 5 bones and by removing all of the meat from the ends. I used the 5 bones for the upper arms and the strips of meat as the collar bones. 2. Barbecuing is one of the great talents of Americans. I won’t try to tell you the best way to do it because you probably already know. My personal method includes a dry rub, a charcoal grill and 3 hours over indirect heat. Use your own favorite cooking method to get those ribs to taste great. 3. I add the turkey sausage to the grill sometime second hour to make sure that they are slow cooked as well. Normally, I am not a fan of turkey sausage, but some party guests may not eat red meat. By using turkey sausage I can direct those guests down to the guts for a politically correct snack. 4. Nothing complements a fall barbecue like carving pumpkins, so I take this time to carve the skull. For making a quick skull I like to use a pear-shaped pumpkin. I turn it upside down. I gut the pumpkin from the bottom of the pumpkin (which is now the top of the skull) and carve away. I cut out the eye sockets, nostrils, and a mouth. It isn’t a terribly difficult carving and I can do it while some of the other stuff cooks. 5. Making the lungs is easy too. I follow the directions on an entire box of instant mashed potatoes. Before making this corpse I had never made instant mashed potatoes, I always stuck my nose in the air and made the real kind. You know what? They tastes just about the same and they are a million times easier. Instant potatoes are definitely in my future. After making the potatoes I let them sit for about 30 minutes so they weren’t too hot to handle. 6. To make the forearms, hands and feet I popped open a tube of Pillsbury breadsticks and started to form them up. I made the hands by grafting 5 pieces of raw breadstick together in the shape of a hand. The feet were done similarly. The forearms were even easier. Each was made from a single breadstick that I separated down the middle. These things didn’t taste that great, but they filled in the blanks where the hands should be. I should also mention that people ate them all. 7. The blood is simply barbecue sauce. I tried to adjust its color with different food colorings but turning something that is dark reddish-brown into another color isn’t so easy. Finally, I decided to just recommend using straight barbecue sauce. It looks fairly bloodlike anyway. 8. Guard Your Table. October here in Michigan is cold so I was forced to serve my corpse indoors. This took away the possibility of flies adding to the realism, and made my cleanup preparations that much more important. I had to protect our house. After all, only children are allowed to ruin the place. Adults have to be neat. I used two tablecloths to keep our scratched-up table from getting dirty and it worked! The white tablecloth looked very clinical and cleanup was a snap. 9. Layout the victim. I started from the head and worked downward. a.	I place the head first. I had to cut a hunk off the back of the pumpkin to get it to sit right, but after that he stayed in place all night. b. Next, I situated the collar bones and upper arms. c.	I plopped down all of the mashed potatoes into two big lungs. If my corpse had been a smoker I could have tainted them somehow, but I went with a non-smoker. d.	The ribs rested nicely on top of these to give the impression of a full chest cavity. e.	The guts consisted of some microwaved broccoli and the roasted sausages. I wish I could have used one continuous length of sausage but I worked with the supermarket brand turkey sausage. f.	The forearms, legs, hands and feet were all set into place. g.	The pelvis area was fairly empty so I decided to paint a pelvis onto the table cloth with the barbecue sauce. It worked! I was on a roll. Perhaps I was born to recreate death and dismemberment? h.	Finally I poured and brushed barbecue sauce all over everything. I created some random splatter as well as some disgusting looking areas. It was fun and quick. My friends were excitedly watching me do it. 10. Everyone dug in. When I came up with this concept I thought no one would want to eat it, but it turned out to be one of the easiest, most successful party dinners I have ever made. I am going to make another one at Easter. Just kidding!